Martin Luther King. Credit: mugshots.com. All rights reserved. 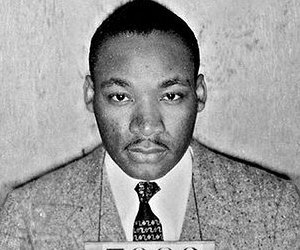 On a winter’s night in 1955, a young preacher named Martin Luther King climbed into the pulpit of the Holt Street Baptist Church in Montgomery, Alabama. Once there, he delivered a speech that would eventually lead to his own assassination, while breathing new life into the struggle to transform the world in the image of love and social justice. If his words are remembered at all these days it’s because of what they helped to launch—the Montgomery Bus Boycott, which heralded a decisive turn in the movement for civil rights. What King said has largely been forgotten, yet the content of his speech was revolutionary in ways that stretch far beyond the context in which it was delivered. As I listen to it now on a scratchy YouTube clip, the hairs on my neck stand up straight, the crowd of voices rising to a crescendo as King talks about the keys to the struggle for equal rights. Love is the anchor or inward expression of social justice, I think King was saying, and justice is the outward expression of “love in calculation”—a conscious design for remaking the world in a different image of ourselves. Radical transformations are possible if love and justice reinforce each-other to create a permanent shift in direction among human beings and the institutions they create. “Only new selves could give birth to a new world, but only a new world could sustain the new human beings who constituted it, and who would sustain it in turn,” as Josiah Royce put it in the aftermath of the American Civil War almost one hundred years before. Then as now, there will be no end to patriarchy without deep-rooted changes in men’s behavior; no solution to climate change unless all of us reduce our consumption and carbon footprint; no decline in inequality unless we learn to share resources with each-other; no meaningful democracy until we work through our differences in a spirit of common purpose; no lasting peace if we continue to project our fears and insecurities onto other people. But turning these examples around, there must also be real, living forms of politics, activism and economics that grow from and reinforce the qualities we want to encourage. “We must be the change we want to see” is a favorite quotation falsely attributed to Gandhi, but it’s equally true that ‘we must see the change we want to be.’ And that means showing how real economies can deliver justice and wellbeing, and real politics can bring people together to break the logjam of vested interests. Unfortunately, such boundary-breaking experiments are in short supply, constantly constrained by the mantra that change is impossible because of (insert your favorite bogeyman): globalization, footloose corporations, human nature, the weakening of governments, corruption in politics, the decline of the public or too much time spent on social media. If we believe that only small changes are possible in our political and economic systems, then small change is all we’re going to see—another turn of the wheel with little or no forward movement. The challenges of uniting personal and social change were central to the social movements of the 1960s and 1970s, expressed through civil rights, gay liberation, the rise of the women’s movement and the first stirrings of environmentalism. In the decades that followed, this spirit was less in evidence in politics and activism, though it remained alive among feminists and other radicals like Audre Lorde, June Jordan, and bell hooks. Elsewhere, the social and spiritual sides of activism began to move apart, perhaps exhausted by earlier efforts or beaten down by the arrival of the neo-liberal revolution and the celebration of self-interest and materialism that followed in its wake. But today, there’s a resurgence of interest in the possibilities of transformation and an upsurge in attempts to put them into practice, spurred on by two key developments: first, the failure of conventional approaches to make much headway against inequality and violence; and second, the urgency of problems like climate change which demand boundary-breaking solutions. That’s why we launched Transformation as a new section of openDemocracy in 2013. The goal of Transformation is to “publish great writing at the intersection of the personal and the political,” and there’s certainly an audience for the material that we’ve published: in the last three-and-a-half years our stories have been read by over two million people (40 per cent of whom live in the USA), and around 600,000 of them have returned to the site more than twice. Our contributors are diverse, with 65 percent of those returning our questionnaires self-identifying as women or trans-gender, 55 per cent as aged under 40, and 41 per cent as LGBTQ. Most are activists (many of whom have never written for a major audience before), with good representation from academia and a few professional writers. With funding from a successful campaign in 2016 to raise more support from readers and the renewal of two grants from the NoVo and Hidden Leaf Foundations in the USA, we have enough money in the bank to see us through to the end of 2018, so we’ve decided to take the opportunity that’s provided by some medium-term financial security to make some changes going forward. These changes are designed to expand our reach and strengthen the role of the site in community-building and debate—to engage with our audience in new and better ways and to identify areas that we haven’t covered in our publishing to date, or which need to be deepened. What’s the rationale for these changes? First of all, the data we collect from Google Analytics show that most of the pieces we publish are only read by between 1,000 and 3,000 people. These are respectable numbers given the type of material we cover, but it seems clear that simply publishing more of the same content is unlikely to grow our audience in the future. The articles with the largest audience comprise less than twenty per cent of the total, but they account for the great majority of reads. Therefore—and without closing down space for articles that we want to publish regardless of how many reads they might get—we want to find ways of commissioning more articles that reach a significant audience on key elements of the transformation debate. We think this means publishing less material overall in order to free up time to investigate the landscape of issues and authors, analyze where the gaps are, and engage in discussions about content with other organizations and websites so that we can strengthen collaboration and cross-posting. That’s the second key issue: publishing partnerships and other community building activities take a lot of time and energy to nurture, but the impact of a thriving and well-connected field is going to be much larger than the impact of any one of its components in isolation. So we want to put more time and effort into helping to build a stronger and more influential ecology of communities, groups and organizations that work on the deep transformation of self and society. And that means seeing and using Transformation as more of a shared resource—for example by co-editing special themed content weeks with other groups or handing the section over to others to convene and publish their own material. Putting these ideas into practice requires stronger links with readers, writers and publishers, so we want to encourage you to contact us with your reactions, ideas and proposals. Unashamedly, Transformation was set up to challenge the reluctance of many progressive activists to take the personal dimensions of social change as seriously as the political, by showing that self-development isn’t (or doesn’t have to be) New Age narcissism. Rather, it means engaging in the daily struggle for dignity and justice in a different spirit that opens up more effective routes to action. At the same time, we’re also pushing back against the reluctance of many spiritual and self-help advocates to take the political dimensions of personal change as seriously as the inner life they espouse, by showing that love and compassion flourish more easily when new institutions are built on sharing and solidarity instead of the mindless pursuit of competition, growth and power. Rather than agreement or consensus, there’s a sense that readers, writers and editors are all navigating through territory that doesn’t have a map. Transformation is not another good-news magazine, but a place to engage with each-other about the realities and struggles of the radical imagination. All great stories are love stories in one form or another, but the story of love and justice has not yet been told. With your help we aim to put that right. Welcome to another year of transformation.